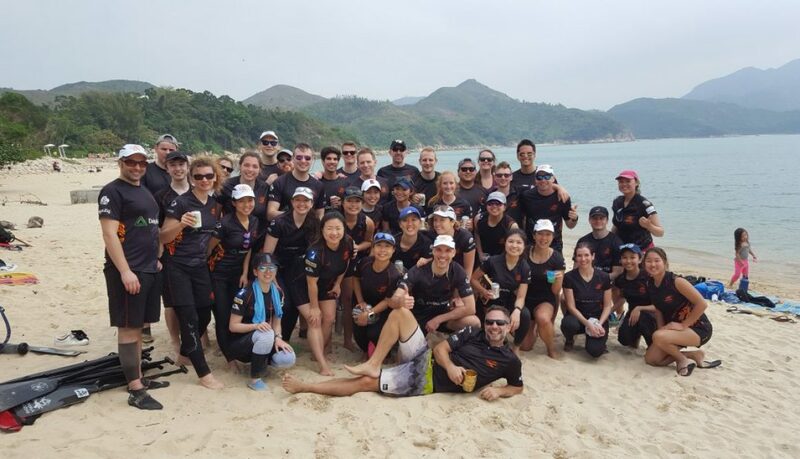 For the second time, the Lamma Dragons had invited Team Loreley to a day of friendly races on their beautiful island; the race is also affectionately called the Double L Cup (Triple L was last year, when the Lantau Boat Club was part of the event). We had a fantastic day of sunshine and wind, racing against each other in a few heats along the shore: three boats to one race, with two Loreley and two Lamma teams participating—Loreley Thunder and Loreley Lightning, and the Lamma Dragons Dragons and the Lamma Dragons Tigers. We then mixed things up, assigning people by lucky draw to four different boats (cleverly named A, B, C, and D). With people from both teams and of various levels of experience, we all needed some discussion to figure out where paddlers would sit in the boat, and what kind of start to do. And of course, there’s no guarantee that an unfamiliar start will actually work… As an additional challenge, not the crossing of the finish line determined the winner but the team whose paddler first reached a paddle planted on the beach. Needless to say, we saw some great running, and also some swimming. After we’d worn ourselves out at the races (wobbly boats, gusty wind, and a wavy sea made things a little more exciting), the Lamma Dragons had prepared an amazing lunch BBQ and buffet with plenty of homemade delicacies, including dessert (Penny’s brownies! heavenly!). Team Loreley was super diligent and brought reusable water bottles and plates and cutlery. In addition to the usual beverages, Alice from the Lamma Dragons had prepared some awesomely potent punch. In addition to our dragonboat racing and mingling, there was also a Holi celebration, which provided great music and which helped make our party more colorful. Big thanks to all from the Lamma Dragons who organized the event, and we’re looking forward to the 2020 edition! Start of the 2019 Season	We took the Pledge!